Our June Spotlight article is all about the benefits of yoga. Over the years, the City and Healthy Saint Paul have encouraged employees to enjoy these benefits by offering lunch time yoga classes. 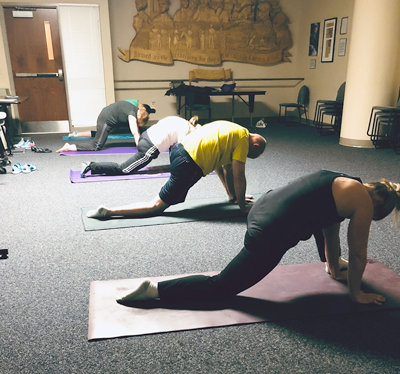 Classes have been held at City Hall since 2005; the Water Department has offered classes for the past three years and in January, 2018 yoga classes began at the Police Department. Below is what employees have to say about making yoga part of their regular routine. Anca Sima is a Public Works employee who is also a very experienced and knowledgeable Yoga instructor. Anca began teaching yoga at City Hall In 2005, and many of the people who began at that time are still participating. Anca stresses that no matter what experience a person may have, her class is structured to accommodate from those ranging from beginner yoga to advanced. Marie Franchett is one of the employees who began with Anca back in 2005 and still participates. She saw this as an opportunity to get in some exercise over the lunch hour. She says it provides a great break in the day, and she finds it rejuvenating. Marie feels the classes have kept her healthy. Since participating for all these years, she hasn’t had any joint or muscle pain issues, except for a sore back due to the shoveling this year! Dolly Ludden and Dennis Rosemark have been doing yoga at SPRWS since the onset 3+ years ago. The Yoga instructor for the SPPD, Cailee Stangl, has specialized training as a Yoga for First Responders instructor. Cailee’s goal is to teach how to overcome stress by providing the tools to add calm back to your life. Sgt. Jim Andersen appreciates the knowledge Cailee brings and how she tailors the class to the individual. Employee Ali Cole says it is a GIFT to be able to take a break during the work day and focus on taking care of herself. will publish a Q&A in a future issue.